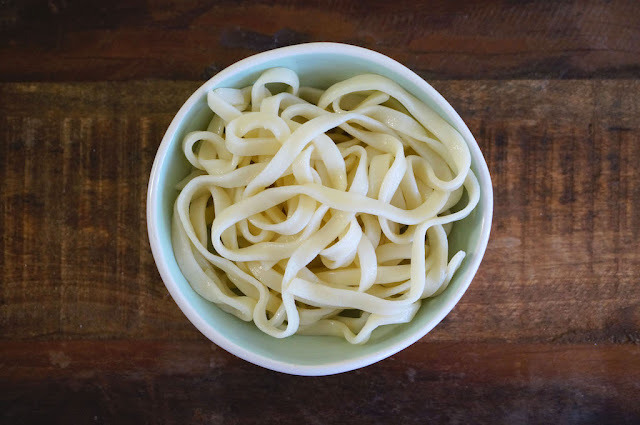 I think homemade noodles are truly a delight. You can adjust the thickness, width, and texture of the noodles to your liking, all while avoiding the usage of any additives. This video is about making noodles without the use of egg. You can make Japanese-styled noodles by using more salt (Udon), and less salt for plain Chinese wheat noodles. Combine flour with sea salt. Then add water and mix well. Gather the mixture into a rough dough. Place it in the plastic bag and let it rest for about 30 minutes. Remove the dough and sprinkle some flour and place it back into the plastic bag. Use a rolling pin, press the dough, fold, flour and press for about 3 minutes. Repeat the process about 3 times. Then roll-out the dough into a rectangular shape, about 16 by 12 inches. Then fold the dough and cut into desire sizes.